Juanita Lake California - Explore! Juanita Lake California - Explore! Juanita Lake is located on the Klamath National Forest in far northern California, just 18 miles south of the Oregon-California State Line on US-97 and 6 miles west on local roads. 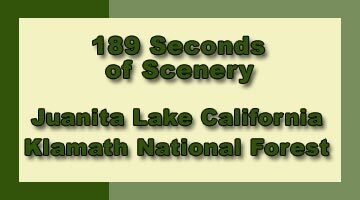 It is a great, but little known, get-away for campers and lovers of non-motorized water sports. Not only that, but the lake is circled by a handicapped-accessible, asphalt-paved trail, making it a great place to explore in a wheelchair. Upon arriving at the lake, there is a good-sized parking area and restroom for those that want to use the lake, but don’t want to spend the night. The day-use area includes picnic tables and benches, a dock and boat launch and an unmarked and unguarded swimming spot. If you like to fish, the lake offers trout (brook, brown and rainbow) , large mouth bass, golden shiner and brown bullhead. There is a well-appointed fish-cleaning station at the day-use area to help with that chore (constructed in 2004). There are also some interpretive signs adjacent to the fish cleaning station to orient you to the lake. As you drive past the day use area you enter the camping area (reconstructed in 2009). It offers 23 campsites with parking, picnic tables, grills and fire circles. Some of the sites are accessible to those with handicaps. There are several vault toilets, potable water spigots and bear-proof trash containers scattered around the camping area. A separate group camping area is located south of the main camping area, also along the lake. The group area is entered by a road that you will see before you come to the day use area. The group area can accommodate up to 50 people – reservations required. The regular camping area is available on a first-come, first-served basis. You simply find a vacant site, park your vehicle there, walk down to the day use area and get an fee envelope. 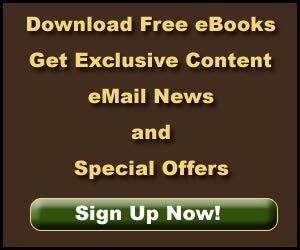 Fill out the form, put your check in the envelope and drop it in the receptacle. Part of the registration form is a tag to hang on a post at your campsite and a tag to leave on your vehicle’s dashboard. The fee at the time of this writing was $15 per night. Those with a Senior Pass pay half that. There are usually campsites available during the week, but by Friday afternoon, most will be in use for the weekend. 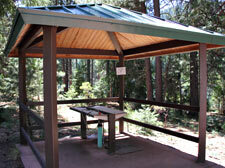 Both campgrounds are well shaded with cedar, pine and fir trees. The 55 acre (222,577 square meter) lake itself is man-made (construction was completed in 1964) with a dam at each end as you can see in the aerial photo below. The elevation is around 5,120 feet (1,554 meters). The lake maintains a fairly constant elevation, even in drought years like when we visited in 2014. It typically holds about 348 acre-feet (479 million liters) of water. A small stream feeds the lake from a point near its northwest corner and the lake is surrounded by a 3 square-mile (7.8 square-kilometer) watershed. No motor boats are permitted on the lake. The lake typically freezes in the winter when the only access is by snowmobile, skiis or snowshoes. The lake is popular for fishing, swimming, snorkeling, wading, row boating, kayaking, canoeing, sailing or just floating around or lounging near the shore. Fishing success was quite good from the middle of the northern dam while we were at the lake. The asphalt paved trail that circles the lake is about 1.5 miles (2.4 kilometers) long and is used by hikers and joggers as well as those with disabilities. Bicycles are not allowed on the trail although they are allowed on the paved roads in the campground. There are picnic tables and benches along the trail as well as turnouts where a wheelchair user could park and enjoy the views. There has been some logging on the west side of the lake, probably to remove dead lodgepole pine. Dead trees were removed from the campground a few years ago, but new vegetation has sprung up restoring privacy to the campsites. 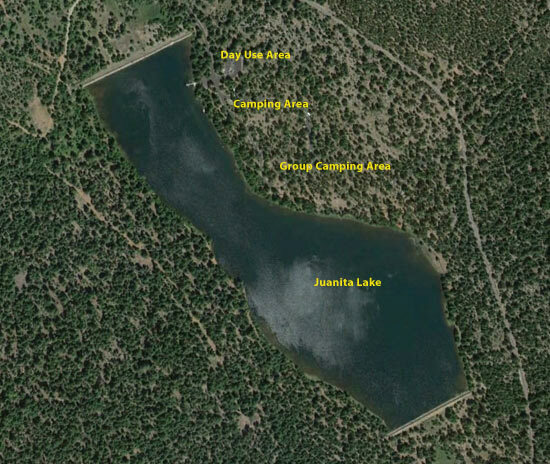 Camping is a major activity at Juanita Lake. One of the campsites is designed to allow a larger recreational vehicle to pull through rather than backing into a spur. The layout of the campground is shown in the graphic below. Most spurs will accommodate a 42 foot (13 meter) vehicle while some sites can handle up to 60 feet (18 meters). The campground is great for tents of almost any size. The area is a haven to a variety of woodland bird species. Of particular interest are the bald eagles and osprey that are commonly seen over the lake. Every time we visit the lake there seems to be a family or two of ducks paddling along the shore. Black bears, deer, elk and other large mammals live in the area, but you are more likely to see the chipmunks that frequent the campground. Juanita Lake is not a huge adventure by itself. It’s more of a quiet place to relax and leisurely explore. However, if you’d like to add some adventure, there is a trail from the west side of the lake that leads to the Bald Mountain Lookout southwest of the lake. The peak is almost 7,800 feet (2,380 meters) in elevation so the climb is about 2,700 feet (820 meters) over about 6 miles (9.6 kilometers). I didn’t take the trail or even look for trail signs, but there is a segment of the U.S. Geological Survey’s Panther Rock quadrangle map below that reveals no ‘trail’ but a series of old roads leading from the lake to the lookout. 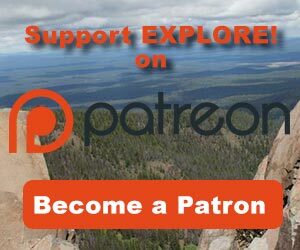 Perhaps we will explore the trail on another visit. 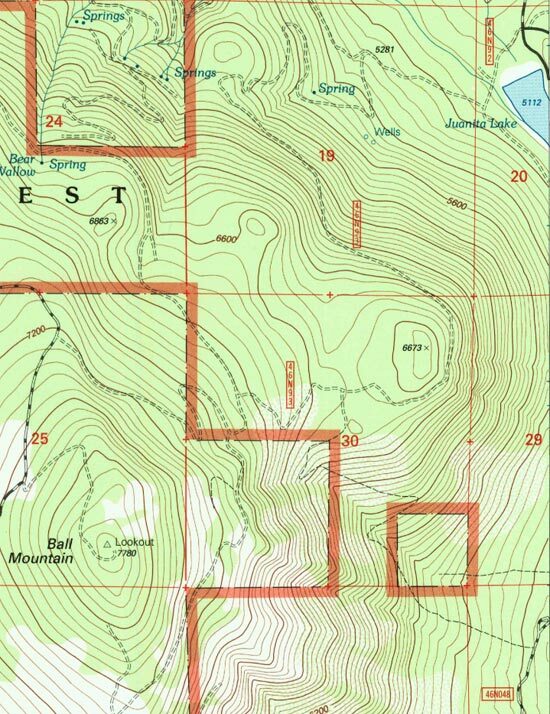 You can download the full map (Panther Rock Quad), or any other USGS Quadrangle map, free, using the “Map Locater & Downloader” at www.usgs.gov. The photos, video and words were developed by Jerry Haugen and ©2014 Global Creations LLC. Aerial photo courtesy of USDA Farm Service Agency. Campground layout graphic courtesy of USDA Forest Service (contract documents). Panther Rock Quandrangle Map courtesy of U.S. Geological Survey.